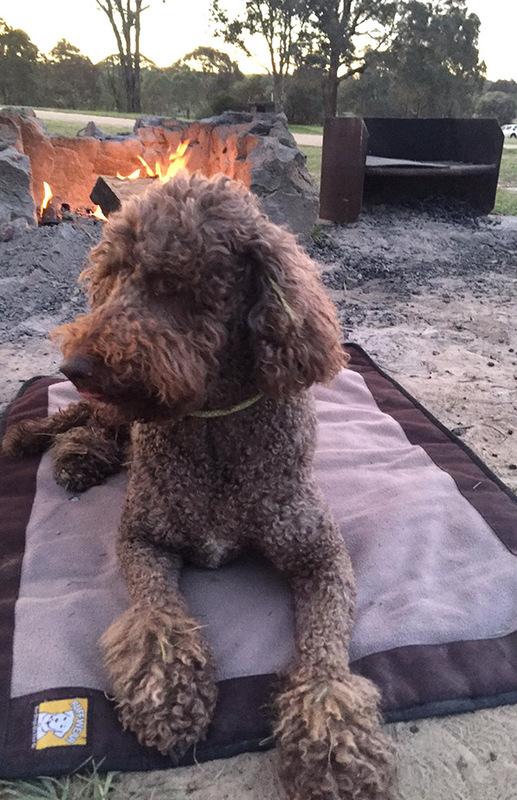 On a recent adventure we discovered a beautiful dog friendly camping spot at Vittoria State Forest, just west of Bathurst NSW. The campground is large and grassy, perfectly suited to both dogs and humans. 1. It’s both well maintained and FREE! Yes, you heard right. You can camp out at no cost and the space is well mown with plenty of room (at least when I was there). Fire pits, picnic tables, long drop toilets and even a bit of running water are available. There’s even a little walk with some fairly exotic species of trees – a bit of an arboretum on the land. On the drive in you can see some beautiful blue eucalypts. There’s also a creek but it’s not recommended for swimming. 2. You’ve got proximity to Bathurst. You can easily pop out to Bathurst and get a bite to eat, visit a gallery or check out some historical attractions. Unfortunately we were there on a bank holiday and many places were closed as a result. We hit the Adventure Playground and the Bathurst 1000 Race Track.. both big hits with the munchkins. (My dog wasn’t overly impressed by either.) Here’s a list of things you can explore in the Bathurst area. 3. You’re a hop skip and a jump from Orange. I had an awesome visit to the Orange Regional Gallery. Very inspiring painting, drawing and sculpture exhibits were on. Lots of good food is available. I was a little disappointed that dogs aren’t allowed around Lake Canobolas where there is a lake cafe & swimming beach. However, I was happily surprised when the sign on the Orange Botanic Gardens had a green circle around a picture of a dog on a lead on the sign. This is a gorgeous place to enjoy a beautiful stroll with your dog. Tulips were blooming everywhere then, but I reckon the roses in the formidable rose garden will be coming out any day now. Here’s some ideas of fun to be had in Orange. 4. Don’t forget the wine, love! Honestly, who doesn’t enjoy a bit of a wine tasting tour? Plenty of vineyards to check out in the area. There’s nothing like being mesmerised by your campfire with a good drop in the evening. Have a look here for some great Orange Region vineyards. There is a wine festival in October and I think it is still on! 5. Wait! We forgot Millthorpe. Millthorpe is the closest town and it is pretty close to perfect. Don’t blink or you’ll miss it though. This picturesque and engaging little town is about one block in size but it’s chock full of interesting stops, art and good food. See what you can see in Millthorpe. The Old Mill Cafe has an outdoor area when your canine mate is welcome, but be sure to call in advance as it’s a popular spot. Frankly I had an AWESOME weekend camping at Macquarie Woods Forestry Reserve, and I hope you will as well! October 23, 2015 | Filed under Dog Friendly Holidays, Living With Dogs, Uncategorized.